Hearing aid batteries do a lot of good, which is why most of us don’t think about the dangers that can be associated with them in potential worst-case situations. Hearing aid batteries pose a decent amount of safety concerns that users should be aware of. They are more than just a choking hazard — the poisonous toxicity of a hearing aid battery can sometimes result in death. 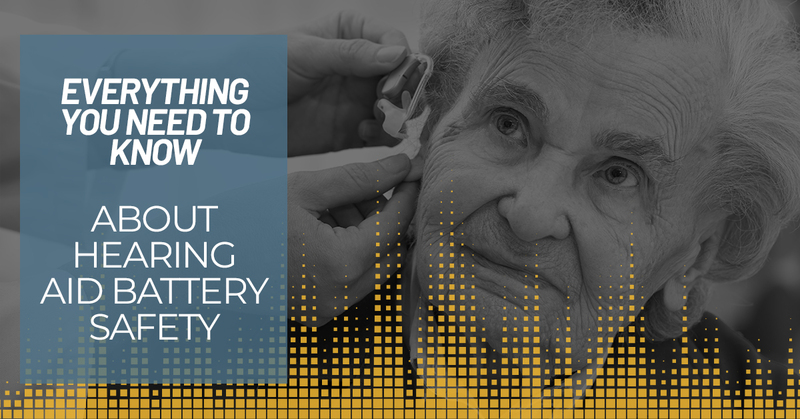 If you or someone you know is a hearing aid user, we’ll go over everything you need to know about hearing aid battery safety to ensure you keep yourself and those around you safe in this blog post. Swallowing a battery may seem like a rare case, but recent data shows Canadians purchase about 550 million disposable batteries annually — accidents are bound to happen with a number that large. Are you looking for an audiology professional to further explain hearing aids to you? Maybe you’re hoping to learn more about hearing aids? Look no further than our staff at Audiology Innovations in Calgary. We have many trained audiologists on staff who can help you find a solution for your situation. Schedule an appointment today. Unfortunately, hearing aid batteries can be very dangerous if they are swallowed. This is most common among pets and children, but the effects are just as dangerous if an adult were to swallow these batteries. Blood swelling in the back of the throat. If you or someone else has swallowed a hearing aid battery, please contact your local emergency department immediately. Have the battery identification number, which can be found on the packaging or a separate similar battery, handy, if possible. Do not let this person eat or drink anything, and avoid inducing vomiting. There are multiple physical risks that can occur when a human or pet swallows a hearing aid battery. The alkaline material in the battery can leak, ultimately resulting in internal burned body tissues from the chemicals. They are also potential choking hazards, and signs of internal burns from batteries can occur as early as 2 hours after ingestion. In the worst possible case scenario, the battery can burn through major internal vessels, which can result in death. Keep your batteries stored in a safe place, out of reach of children and pets. Don’t let your children play with your hearing aid or hearing aid batteries. When you change your hearing aid battery, do so over a flat surface — counter, table, etc. Also, flatten a cloth over the flat surface. This way if you accidentally drop one, it can be easily found, and the cloth will ensure the battery doesn’t bounce off the surface. Don’t put your batteries near any food or drinks. This will keep them from being confused for a pill or piece of candy. Keep your batteries in an isolated, well-labeled bag so they don’t get mistaken for pills or some other type of small edible object. For more information tips, please feel free to reach out to our team of audiologists in Calgary here. You can also consult our blog and resource page for more valuable hearing loss and hearing aid information. At Audiology Innovations, we offer rechargeable hearing aids as an option for our patients. All that’s necessary for these types of hearing aids to work is a charging case, which eliminates the need for any type of battery use. Not only is this type of hearing aid environmentally friendly, it is also a great option for those with dexterity issues. By upgrading to this innovative technology, the risk of you or someone you love swallowing a hearing aid battery is greatly reduced. At Audiology Innovations, our audiologists in Calgary can assist you with several issues associated with hearing loss and provide you with the necessary educational resources for your individual situation. We’ve worked closely with patients who struggle with this issue for more than 15 years, and we can provide assistive hearing devices, hearing aids and hearing aid education for our patients. For any further questions you may have concerning hearing aids, or to schedule an appointment with one of our audiologists in Calgary, please feel free to reach out to our audiology office. You can call us at (403) 252-4722 or fill out our online form here.